Advice sometimes has little or no effect in making people fall in line or do the right thing. For many years, as the road traffic has gradually grown, the Traffic Directorate has been bringing out advisories and exhorting people, and pleading with them to see reason and follow the rules of the road. But this has had little effect on a majority of drivers. Even speed cameras have failed to curb the menace of accelerator-happy drivers. So finally the Traffic authorities had to come up with a novel method to ensure everyone fell in line. This method is going to be implemented across the Kingdom from Monday 8 February. It is the new Points System which has been applied in many countries for many years. Under the Points System a driver can make a mistake on his/ her own peril. And successive mistakes means the suspension – and eventually the permanent withdrawal in the case of repeat offenders – of the driving licence. The more traffic violations one commits the closer he comes to have his licence withdrawn or cancelled. No need any more for the Traffic Directorate to cry hoarse about the need for safe driving, wearing the belt, not jumping the red signal, not entering the yellow box prematurely and so on. The points will do the talking. Thus, the minimum punitive points are 2 and the number for each violation goes on increasing depending how dangerous is the action, behaviour or stunt a driver has performed, the maximum number of points for a single offence being 10. The driver’s point-clock begins to tick on the day he commits the first offence and for one year from that date the points go on accumulating. If the figure adds up to 20 points in one year the driver has his/ her licence withdrawn. “The implementation of the system aims to promote a sense of responsibility among drivers, especially those who intentionally violate traffic rules,” says Traffic Directorate Director-General Shaikh Nasser bin Abdulrahman Al Khalifa. If a motorist reaches 20 points in a calendar year then the licence would be initially withdrawn for three months, but if it happens twice in a year then the licence is withdrawn for six months and if it is repeated a third time then the withdrawal is for 12 months. And if the violation is repeated for the fourth time then the dirver has his licence withdrawn permanently [and one assumes will have to travel about only in buses all his life since taxis are not easy to come by!!]. 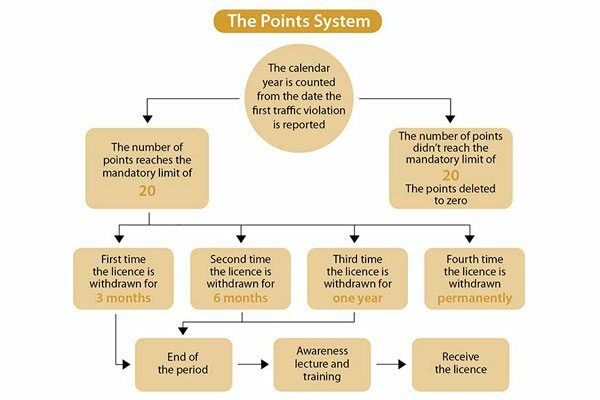 The Traffic Directorate has issued detailed brochures and disseminated information by various means on how the system works and which offence draws how many points in penalty. For example if a driver commits a violation within one year of getting his licence then the poins get doubled. So beware all careless and ‘fun-loving’ drivers! Previous articleGrowing the Yum Yum Tree!